My Dogs Love Me: Mischief Monday: Christmas Delays! It's pure coincidence that I recently found out that it is during this time that I should be sending out all my mails for Christmas. Last year, we joined our first Christmas Card Exchange. Coincidentally, 364 days ago, I had done all these already. These are the days that I am glad that I write my posts as myself and not as Chooey. Because if it were up to her, you'd probably be reading a whole article of disgruntled dogs and an irresponsible Haopee. 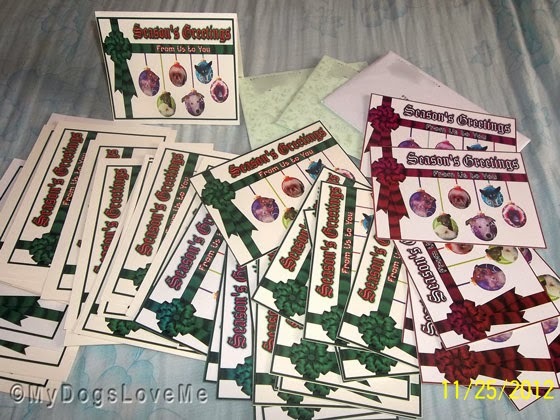 So for those who will be receiving our cards late, I am now sending out my apologies for the delay. We've joined the Monday Mischief bloghop. No worries and ours is in the post to you as we type. Have a marvellous Monday. Almost the entire month of November has been spent wiping kitty snot and I haven't even had time to think about Christmas cards. And Christmas is just a month away. Arrrrghhhh! We haven't even gotten started . . .
What, whos at fault here, Bites get a rope, no cards yet. Hey ours left already! Don't worry. For once, we've done ours early! Remember this year to check with your neighbours if you don't have cards...BOL! Thanks for waking Dad up, he hasn't even started on ours yet he might listen to you. Don't worry, you are NOT alone. We haven't even started ours yet!